Maggie has gone from being a lone elephant - not only at the Alaska Zoo but in the entire state of Alaska! - to one of the more gregarious elephants at the ARK 2000 sanctuary. November marks the 10-year anniversary of African elephant Maggie's arrival at the ARK 2000 sanctuary. What we celebrate today is her resilience as an individual - not her captivity through no choice of her own. Most captive elephants have a story to tell of hardship, spirit, and survival. We think you'll agree that Maggie's story has all of that, and more. Maggie's life story began in Zimbabwe, Africa, where she was born into a closely-knit elephant family. But her life would change forever after her mother and family were gunned down during a government-sanctioned cull. Traumatized calves like Maggie were usually spared so they could be sold into captivity. The Alaska Zoo acquired Maggie in 1983 when she was a small calf. She would spend the next 24 years in Anchorage, the last 10 years of that time alone in a small enclosure. But then things changed again. 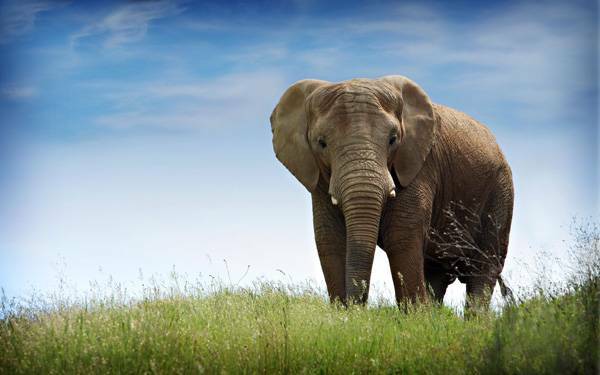 . .
A group of Anchorage citizens believed it was time to let Maggie retire to a place with a warmer climate and more natural surroundings, and where she could live with other African elephants. Their impassioned outcry soon spread well beyond Alaska's borders. Around that time Maggie also developed some serious health challenges related to her confinement. Fortunately, Alaska Zoo Director Pat Lampi and the zoo's board of directors did the right thing and voted to relocate Maggie. PAWS was honored when they chose ARK 2000 as her forever home. Being the special elephant that she is, Maggie was flown to California by the U.S. Air Force in a move they dubbed Operation Maggie Migration. Because no commercial airline option was available to transport her, Maggie was flown aboard a C-17 Globemaster III from Elmendorf Air Force Base in Alaska to Travis Air Force Base in California. 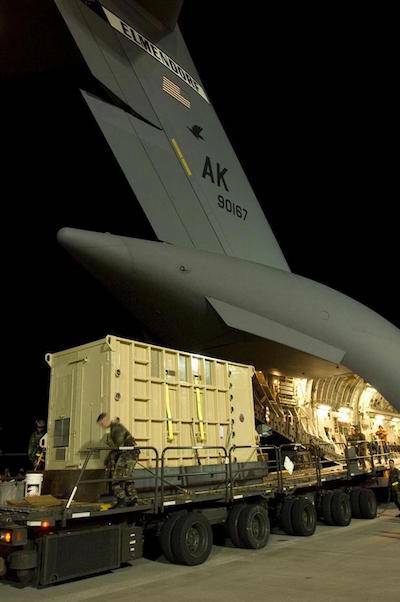 U.S. Air Force crew at Elmendorf AFB in Anchorage, Alaska, load Maggie's crate onto the C-17 Globemaster III that would fly her to California. From there she traveled by truck to her new home at PAWS. The Air Force was reimbursed for the full cost of transport by Emmy Award-winning television game show host and animal advocate Bob Barker. 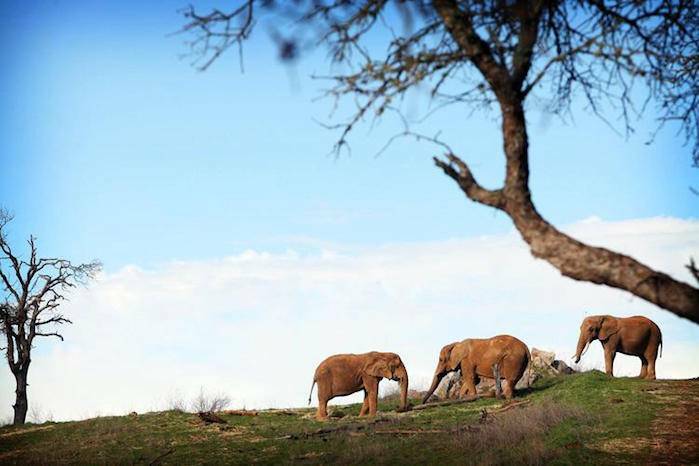 Thanks to moderate California temperatures, Maggie can spend her days outdoors in a large natural habitat where she engages in behaviors natural to elephants: walking as much as she likes, foraging on green grass and trees, exploring the environment, or lying down to nap on a sunny hillside. Maggie has gone from being a lone elephant - not only at the Alaska Zoo but in the entire state of Alaska! - to one of the more gregarious elephants at the ARK 2000 sanctuary. She has forged friendships with other elephants, and socializes these days with friends Lulu and Toka. In fact, the two elephants stand guard over Maggie during her afternoon naps, only moving away once she rises. (including Michelle Harvey, who had formerly cared for Maggie at the Alaska Zoo), and everyone who tracks her continuing story through PAWS' social media sites. The people of Anchorage and the Alaska Zoo have remained true friends, visiting Maggie during our "Seeing The Elephant" weekends, open houses and other welcome visits. Alaska Zoo Director Pat Lampi not only visits Maggie, he has participated as a speaker at PAWS' International Captive Wildlife Conferences (next conference will be in Los Angeles in November 2018). Maggie is truly a special elephant, and PAWS is proud that we have provided a loving home for her for the last 10 years. We look forward to many more.